Lawn care is the foundation—a 7-step weed, fertilization and lawn health care plan that treats and prevents common problems. If the grass is greener next door, maybe it’s time to give Grassperson a call. A perfectly green lawn doesn’t happen by accident. At Grassperson, we’ve mastered the formula for a healthy, weed-free lawn—and the key is consistent use of our 7-step custom lawn care program, coupled with proper landscape maintenance. We work closely with lawn product suppliers, who advise us on the latest formulations for fertilizing and preventing weeds and lawn disease. The products we use today are safer than ever before, and because we apply products in the right time, place and with the right technique, it’s better for the environment. Our team will tailor a lawn care program that brings your property up to par, and we’ll maintain it up to standards. Your satisfaction is guaranteed. If you spot a problem, our team will respond immediately and make it right. Weeds don’t stop growing in winter. And lawn disease can set in when you least expect it. At Grassperson, we never let our guard down. 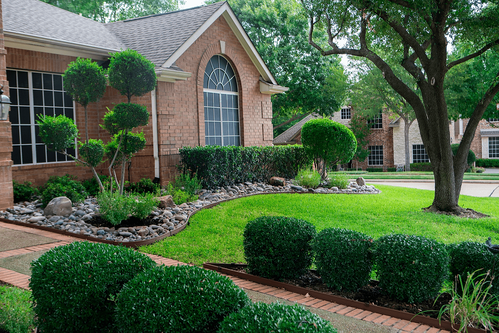 We are licensed by the Texas Department of Agriculture, and our experienced team implements a 7-step year-long lawn care program that is tailored to your property’s needs. That way, you can rest assured your property is getting the nutrition and protection it needs during all four seasons. Keep Weeds Away. Stop fighting the weeds. Let us take care of your lawn. With Grassperson Lawn Care, we stay on top of the uglies and are on call to manage any weed issues that crop up. Stop and Prevent Lawn Disease. Our lawn care program is designed to prevent lawn disease that can cause bare spots, brown spots and damage. Replacing a lawn is expensive—caring for it with Grassperson lawn care protects your property. Create a Healthier Lawn. The point of a lawn care program is to establish a healthy lawn that will naturally fight off weeds and disease because it’s stronger than the bad guys. With consistent use of a Grassperson Lawn and Landscape Maintenance Package, your yard will look better and be in the best shape possible. Get the Green-Up You Deserve. A vibrant, green lawn is attractive, adds value to your property and is exactly what you get with Grassperson Lawn Care. What are you waiting for? If you look at other yards and feel green with envy, it’s time to get Grassperson Lawn Care and get the best lawn on the block. Call us for a free, custom estimate. We’ll visit your property, measure it and determine its needs. You want the lawn that your neighbors will envy—thick and healthy, clean-cut and cared for, a lawn that makes you smile when you pull into the driveway. But getting your Texas property to look this way can be an aggravating quest: It takes time (lots of time); money spent on equipment, fertilizer and other lawn care products; and knowledge of what to do and when to do it. Maybe your lawn just looks okay now. The weeds aren’t totally taking over yet, but you can’t seem to stop them from creeping into landscape beds and cropping up in the grass. Maybe you’ve even hired a pro to get the lawn you really want, but you just haven’t seen the results you expected. 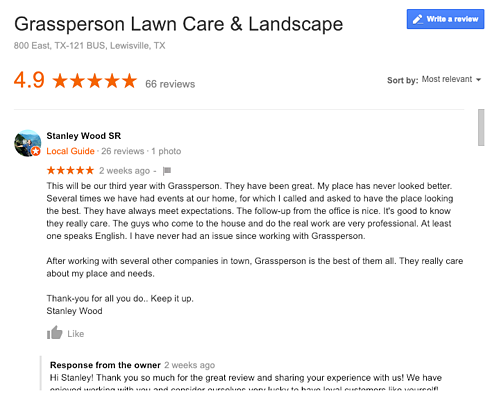 (Surely, if you pay a lawn care professional to take care of your Texas lawn problems, you should have a yard you feel proud to own. But, no.) Or, perhaps you’ve been taking on the lawn care yourself and are tired of spending entire weekends stuck doing yard work. Getting the lawn you seriously deserve takes a lot more work and experience than you might have imagined. And, if you hire a Texas lawn care company to help, you should see results. If you’re reading this, you’ve likely decided that the health and appearance of your lawn matters. What you’re doing now isn’t getting you the outcome you desire—the best lawn on the block. We’re homeowners, too, and we love coming home to a beautiful lawn. We get it. 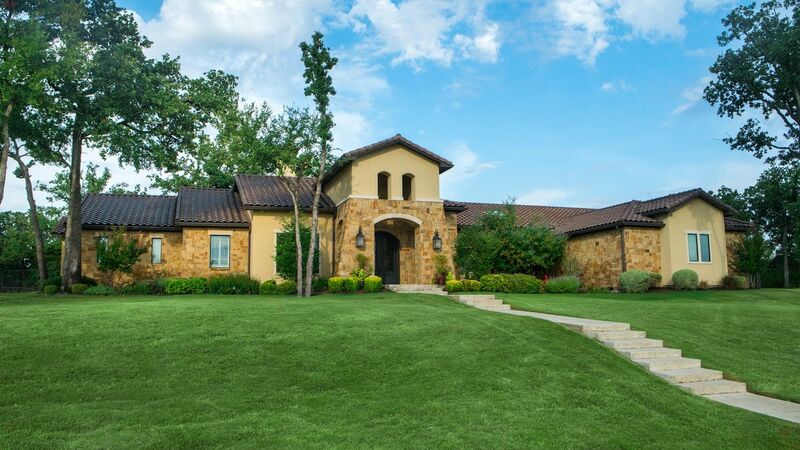 Here, we’ll share how to have a thick, green lawn in Texas, so you can make the best decisions for your property. We’ll give you tips for tackling common Texas lawn problems, fertilizing your lawn, mowing, watering, and what an effective lawn care treatment schedule looks like. Also, with this lawn care guide, you’ll be prepared to hire a pro that can live up to your expectations so you get the lawn you deserve. Weeds are always looking for an opportunity to take root. Thin turf and weak spots in a lawn are attractive real estate for weeds to move in. Ultimately, a dense, healthy lawn is the best defense against weeds. But, even healthy properties aren’t off the hook—weeds are persistent and require constant monitoring, early detection, prevention and curative treatments. Here in Denton and Collin County, TX we deal with several common broadleaf, grassy weeds, and sedge weeds. Those include Buttonweed, Dandelion, Henbit and Spurge, among others. Grassy weeds include Crabgrass, Poa annua and Dallisgrass. These weeds germinate and grow at different times of the year. The sedges we deal with most of the time in North Texas are Purple Nutsedge and Yellow Nutsedge. You’ll notice these weeds because of their light green color, thick leaves and fast growth rate. 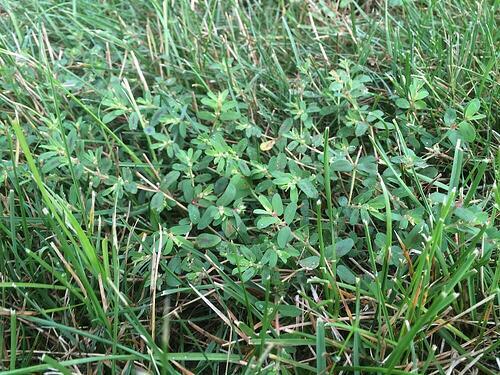 Summer annual weeds like Crabgrass and Spurge germinate in the spring and grow through summer. (These weeds die or go dormant in fall.) Winter annual weeds like Henbit germinate in late summer/early fall and grow through fall and winter. Then, there are perennial weeds like Clover, Dallisgrass and Nutsedge that grow during warm or cool months. So basically, you need to be focused on preventing and treating weeds year-round. The weed pressure is always on. The good news is, a knowledgeable lawn care professional will identify weeds properly so they can be treated effectively. And, an annual Texas lawn care program will address most weeds that are problematic in the Flower Mound, Highland Village and Lewisville, TX area. Lawn care in Texas involves pre-emergent weed control in late fall and early spring to prevent weeds like Crabgrass, Poa annua (Annual Bluegrass), Spurge and other grassy weeds. (Note, you cannot get preventive protection against every weed that grows in Texas.) Post-emergent weed control during the growing season helps manage weeds that crop up, which is inevitable. Weeds happen. They grow in the greenest yards—but you can get a handle on common broadleaf and grassy weeds with a lawn care program that targets these bad boys. Insects can become big problems in lawns, and public enemy #1 is the grub. Grubs are by far the most common lawn insects, and they feed on turf roots. Grubs are active April through June. Then, they morph into June bugs—which lay eggs before ending their life cycle, and the circle of life starts over. Not all Texas lawns have grubs, and there isn’t necessarily a reason why one lawn is more appealing to grubs than another. But, if your property has a history of grubs and resulting lawn damage, investing in grub treatment will help protect the health and appearance of your lawn. Grub prevention can be applied to lawns March through May, before the heavy grub season. Curative treatment occurs during grubs’ most active cycle in the lawn, April to June. 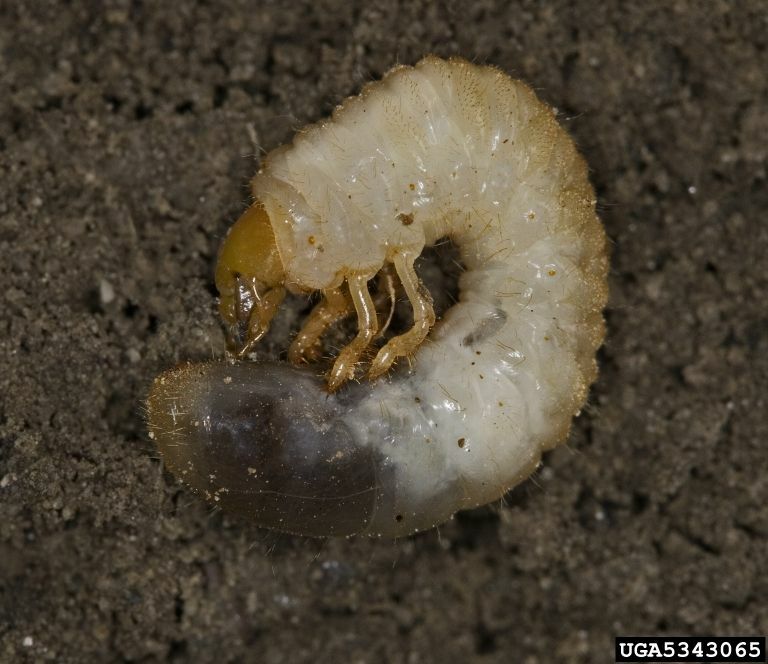 What are some signs that grubs are infesting your Texas lawn? Animals like armadillos and moles burrow into lawns to feed on grubs, and their digging around in the turf to get a good meal can cause major destruction. You’ll end up removing damaged turf and re-sodding the affected area. Other signs of grub damage are if you can easily peel back turf from the ground. This happens because grass is no longer rooted into soil, since grubs like to feast on turf roots. Grubs aren’t the only insect problem we have here in Denton and Collin counties, TX. Chinch bugs are an issue in St. Augustine grass lawns. These small black bugs are active in late summer to early fall. During this time, Bermudagrass can also fall prey to Bermuda grass stunt mites, which cause rosetting and tufted growth so grass blades have a “witch broom” effect, which can kill turf. 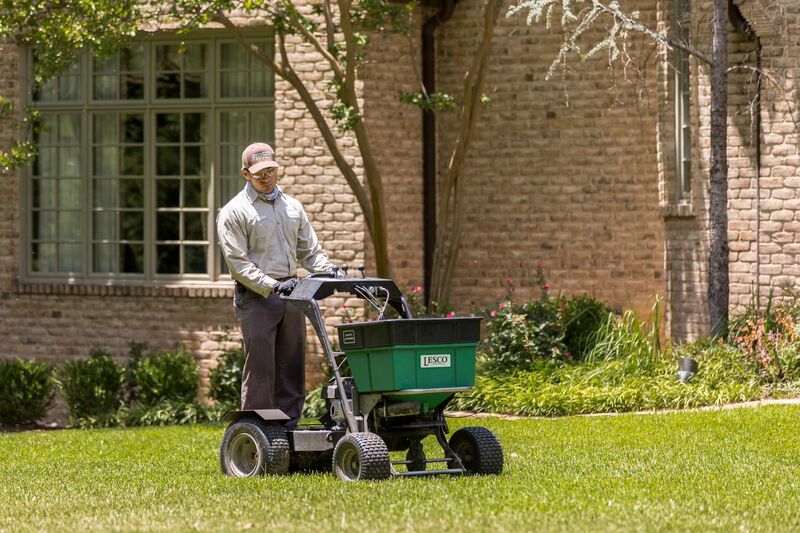 Lawn care in Texas is a year-round endeavor, and we fertilize lawns four times from April to October so turf is constantly getting the nutrition it needs to grow strong. Why fertilize your Texas lawn? For one, fertilizer provides essential nutrients to improve turf color and thickness, to help grass stand up against environmental pressures, and to aid in healthy turf root development. The reality is, our soil is not perfect for growing grass. But fertilizer enriches the soil with the ingredients grass needs to thrive. Do you struggle to get your lawn to look lush and green? You’re not alone, and we know that lawn maintenance in Texas can be frustrating. Without fertilization, you’ll have a tough time getting rid of the lawn problems you’re dealing with. Fertilization is the foundation of a lawn care program. Fertilizer works effectively when it is watered in, so if there is no rain in the forecast after it is applied, plan on running your irrigation system. Save mowing for at least 24 hours after a fertilizer application. That way, the product can absorb into the soil. Spring and fall are ideal times to aerate a lawn in Denton and Collin county, TX. 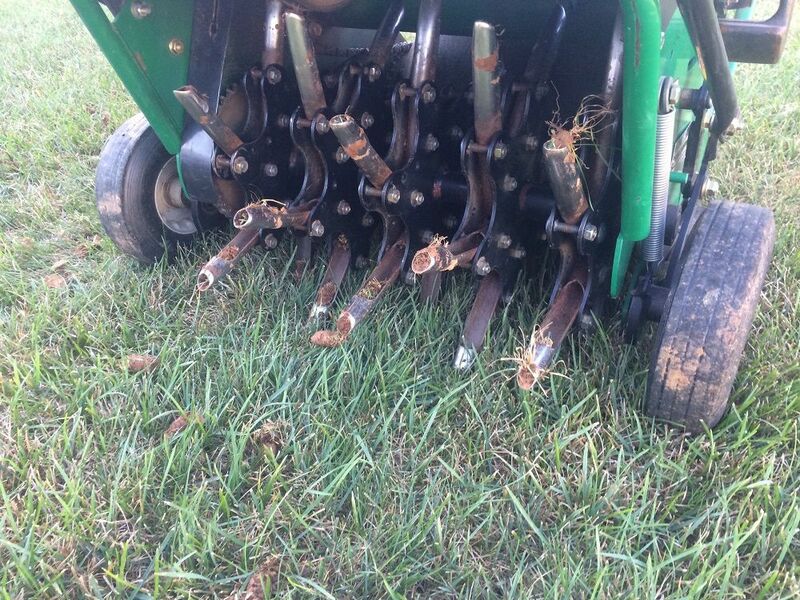 Why aerate? Aeration alleviate soil compaction, and when soil is compacted, it’s harder for air, water and nutrients to get where they are needed. Also, excess thatch—common in Texas Zoysia grass—builds up between grass blades and the soil surface. It can prevent these essential elements from reaching roots. So, really, aeration is a one-two punch that improves soil composition and reduces thatch buildup. 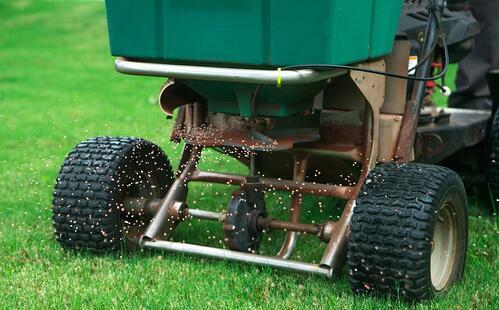 Aeration is often performed in combination with overseeding. After soil plugs are pulled out of your yard to give the lawn “breathing room,” a layer of fresh, rich soil and seed can fill in the lawn with healthy, new growth. There aren’t too many folks in north Texas who want to seed a lawn from scratch. Sod is the go-to way to install a new lawn, or to fill in problem areas from disease, weeds or insect damage. Why is sod preferred in Flower Mound, Highland Village and Lewisville, TX? For one, sod truly gives you instant gratification because you’re laying down squares of grass tightly together for an instantaneous new lawn. There’s no waiting to see green. With seed, you can expect to wait up to six weeks (sometimes longer) for growth to fill in, and during this time you’ll refrain from mowing and lawn care so it can grow without disturbance. 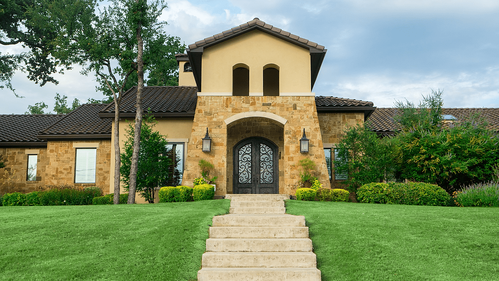 There are three types of grass that grows well in Denton and Collin counties, TX. 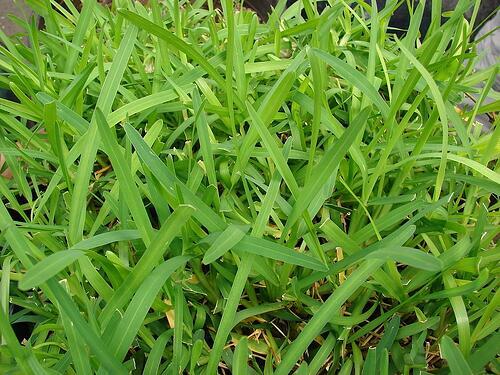 This hardy grass goes dormant in winter, greens up in spring and maintains its vigor through fall. Bermudagrass does not tolerate shade, but it deals with foot traffic and stands up well in high heat and dry conditions. In a word, Bermudagrass is resilient. This variety is somewhat shade tolerant—more so than Bermudagrass, which really requires full sun. So, if you have trees on your property, this turf type is a viable option. What people love about warm-season Zoysia grass is how it produces a dense, thick lawn. Seeding should occur March through April, during the growing season. Sod can be installed year-round—even in winter. With seeding and sodding, frequent watering multiple times per day is critical. Especially with sod, we recommend multiple daily waterings. 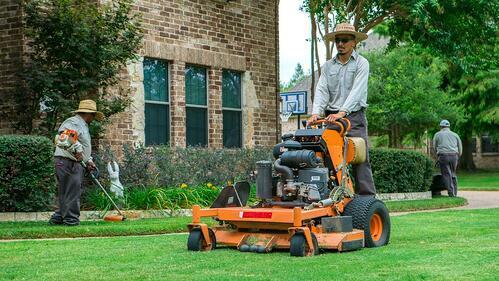 Mowing is usually a weekly lawn maintenance necessity in Texas during the growing season, which is spring through fall. However there are some caveats to this that make it vary. Later in spring through when fall arrives, when we see faster grass growth, you’ll realize that your lawn needs mowing every week. Trying to mow your lawn less than weekly can take longer and be more work. It also might be harder on your equipment and will most likely damage the grass because you’ll be cutting more than ⅓ of the overall growth. The result could be an untidy looking lawn. At the end growing season (October to November), bi-weekly mowing may be adequate as the grass isn’t growing as aggressively. As you can see, mowing is a year-round activity. Now that you’ve got the timing down, let’s address proper mowing practices. The height at which you mow grass will depend on the turf variety. Bermudagrass should be mowed to 1 to 2 inches; St. Augustine grass, 2.5 to 3.5 inches; and Zoysia grass, 1.5 to 3 inches. When mowing, avoid taking off more than 1/3 of the grass blade in a single pass. If you’ve let the lawn go too long between mowings, this could mean you have to mow the lawn twice to achieve the optimum height. Grass edges can quickly creep onto sidewalks and landscape beds. We recommend trimming lawn edges every time you mow if you want to get manicured results. And, it costs less to stay on top of edging rather than waiting until a pro has to chop back big edge pieces of unruly grass. The results are also better when you keep up with edging because you’ll get a cleaner, more precise line. Be sure mower blades are sharp so your equipment makes a nice, clean cut and does not damage the turf. Blunt mower blades can tear grass rather than neatly cutting through it. The general rule of thumb is to sharpen mower blades every 20 to 25 hours of mower use. Most people need some help with this process, and there are tools required to sharpen (or replace) mower blades. We recommend consulting a professional to complete the service safely. 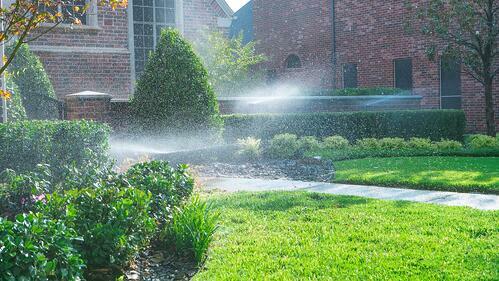 Lawn care in Texas involves watering your property—because our hot, dry summers are stressful for grass, and sandy Texas soil doesn’t hold water long. Timing is everything with watering. The best time to water your Texas lawn is in the early morning so soil can soak in moisture before the sun causes water to evaporate. Not to mention, wind tends to pick up as the day goes on. Watering early maximizes the resource because heat and wind are less likely to “consume” the water you apply. There are different methods for watering your Denton or Collin county, TX lawn. Of course, the best watering comes from Mother Nature, but since she doesn’t always cooperate, we need backup. (Water restrictions and watering schedules are typical during our hot growing season.) Another option is to use a sprinkler attached to a garden hose to deliver water as needed. Now, a Texas lawn care tip: When watering restrictions are in place, we recommend watering in morning and evening on assigned days (usually two days per week) so you can achieve four watering times. This is ideal for summer. Ideally in summer, you should water your lawn three to four days per week. In winter, water your lawn once in the morning, one time per week. Is your lawn getting enough water? The benefit of having a pro on your property on a regular basis is the lawn care specialist can monitor turf health and prevent Texas lawn care problems before they become unsightly, costly issues. If you want the best lawn on the block—and seriously, you deserve it—then the key is a 7-step lawn care plan that provides year-long nutrition, weed and disease protection. Without a commitment to annual care, your lawn will begin to decline. Additional lawn care treatments to address brown patch in Texas lawns and other diseases are not included in typical lawn care programs, but are valuable additional services to maintain healthy grass. You can do as much, or as little, of your own lawn care as you wish. As you now know, getting the best lawn on the block takes time, knowledge, commitment and an eye for lawn care weeds and disease. Can you properly identify brown patch in Texas lawns? And, would you know the difference between an attack by army worms vs. grub worms? A trained, lawn care pro’s eye will help identify Texas lawn problems so you can head off issues that degrade the appearance and health of your grass. 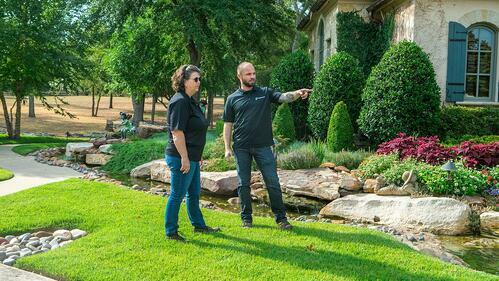 Here are some Texas lawn tips for comparing professionals so you can choose a lawn care service that delivers quality results at a fair, competitive price. Lawn care pricing is generally figured per square foot of grass on your property, and what services are performed during lawn care visits. So, when comparing lawn care companies, be sure to find out exactly what the team servicing your property will be doing during every visit. Companies that invest in training, education and career development grow knowledgeable teams that care about their work. That means, the technician servicing your lawn will take care of your grass as if it were their own (or even better). Because education and training isn’t free, the lawn care company might charge more for its expertise. Remember, you get what you pay for. Another factor that impacts pricing is the company’s ongoing commitment to keep its people accountable so clients receive the best possible service. Sure, you might pay less for a one-truck operator to spray your lawn—but is this so-called pro using best practices and taking necessary safety measures? If you can’t answer that question with, “Yes. Absolutely—and I have proof,” then we recommend you look for another provider. On that note, be sure the company you hire is licensed, insured and bonded. All lawn care companies will claim that they are providing value and the best Texas lawn care. But obviously, that’s not true. Your due diligence should include asking the company for references (and calling them!). Aside from the company’s references, check out online reviews posted by third-party sites like Google Reviews or social media sites like Facebook or Instagram. Online reviews are a great place to start gathering information and ratings from customers. Professional lawn care services are associated with trade industry organizations that promote quality, education and lawn care careers. Find out if the providers you’re considering are involved in local, state or national associations such as the National Association of Landscape Professionals (NALP) or the Texas Nursery & Landscape Association (TNLA). Associations offer education so lawn care specialists can earn credentials and certifications. These are the pros you want caring for your lawn. How long has the lawn care service been in business? What is its reputation in the community? The lawn care industry sometimes gets a bad rap because of fly-by-night operators that have no experience—they’re here one day, gone the next. That’s why you want to be sure the company you hire has an established history. People are the most important aspect of any service business, including lawn care. People make all the difference. A quality lawn care company invests in its people, providing training and career paths. And, its people reciprocate by giving back time, talent and genuine interest in helping customers’ lawns look the best possible. You want a lawn care company whose people go beyond basic training and pursue advanced certifications. You want people working on your property who can communicate clearly and who are invested in your lawn’s success. They’ll point out opportunities for improvement or trouble spots. The best lawn care specialists value the quality of their work, not the quantity of properties they service. They’ll take the time to be sure your questions are answered. Now, you know what it takes to get the best lawn on the block—and we want to help you get there. Maybe you want a program that includes some lawn care and maintenance, but you are willing to handle some tasks yourself. Or, perhaps it’s time to let a lawn care service manage all your yard work so you can enjoy the outdoors without getting your hands dirty.